These are some of the most extravagantly colored flowers in the plant world. 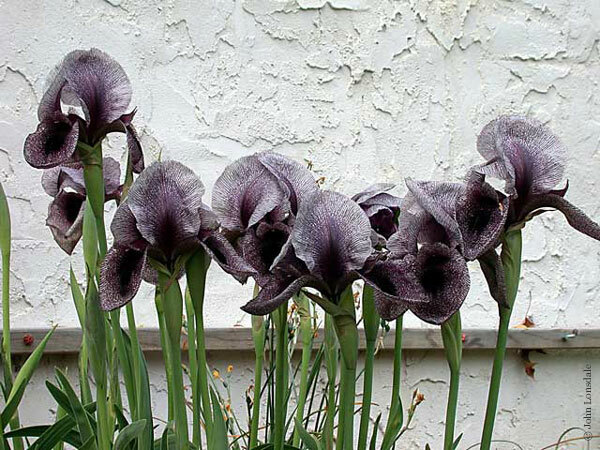 The best show the following characteristics: The aril 'Spot' - a large deep black or dark signal in the middle of the fall, the aril shape with elongate upright standards and curled pendant falls, exotic veins and streak in all parts of the flowers, unusual colors and combinations, extremely rich colors, and some with large hairy beards. Unfortunately, the plants are as exacting as they are beautiful. They DEMAND good drainage and full sun. They prefer totally dry/baking summers, but can tolerate some wetness. In winter they will rot if they get too much rain; many are adapted to parts of south Asia and the Caucasus where they spend much of the winter more or less frozen, making most of their growth in the spring. Jim Waddick grows all of his outdoors year round in a raised wall bed, on top of rocks and rubble to improve drainage in clay soil. He lives in Kansas City Missouri where summer storms are common. Bob Nold grows them in Denver, Colorado, and reports that they are very well adapted to the climate there: "I just plant them." In very wet climates some growers cover the beds with glass or plastic panels to increase baking and some even dig the iris and store dry in a shady garage or shed. More details at the web site of the Aril Society International. 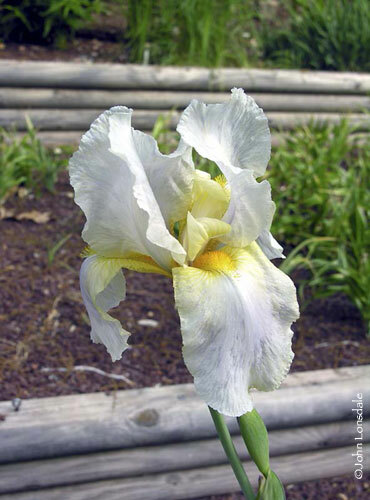 Aril species can be crossed with other bearded Irises, producing plants that are easier to grow. The more pure the species, the more they are restricted in their needs. Many 1/2 and 3/4 aril hybrids do very well in Kansas City. 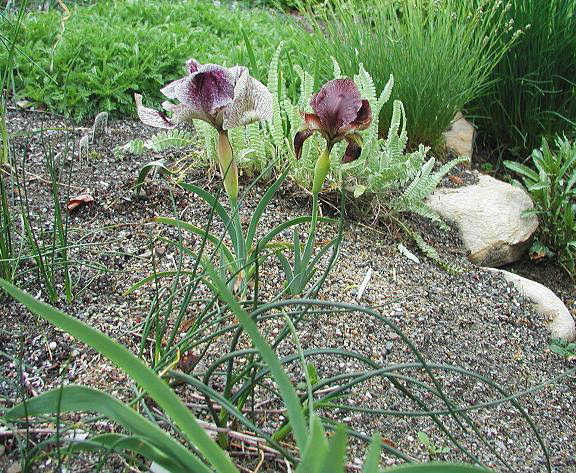 Hexapogon aril irises are semi-desert plants with an unbranched stem, multiple flowers and bracts and bearded falls and standards. 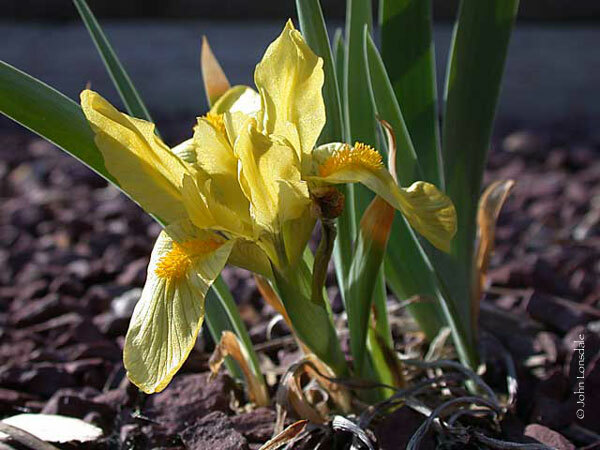 Oncocyclus aril irises occur in areas of dry often hot summers and dry cool or cold winters. They are from western Asia. 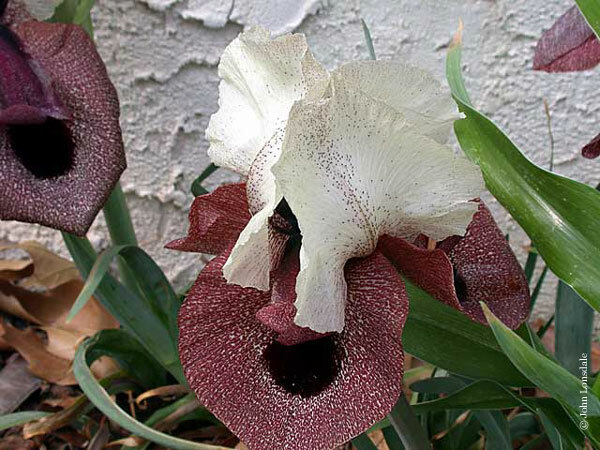 They have solitary flowers that are often veined and spotted. 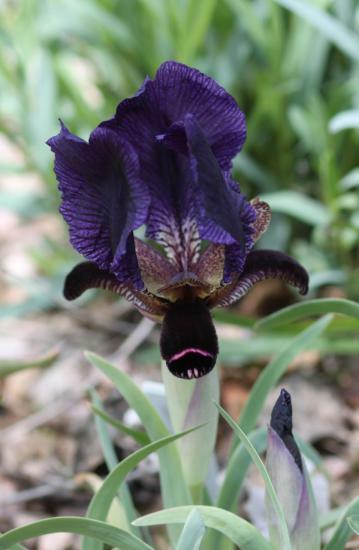 John Lonsdale has written an informative article describing some of the challenges and successes cultivating "onco" Irises in his Pennsylvania garden. 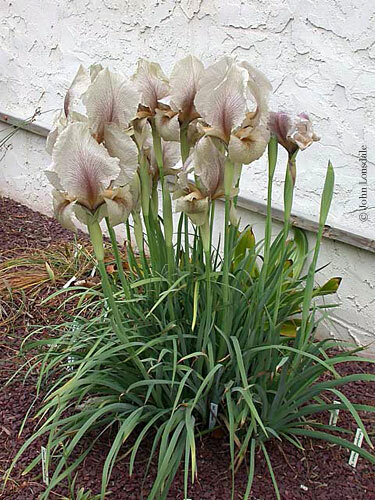 Aril Irises in SE Pennsylvania. Psammiris aril irises have beards only on the falls and are unbranched. 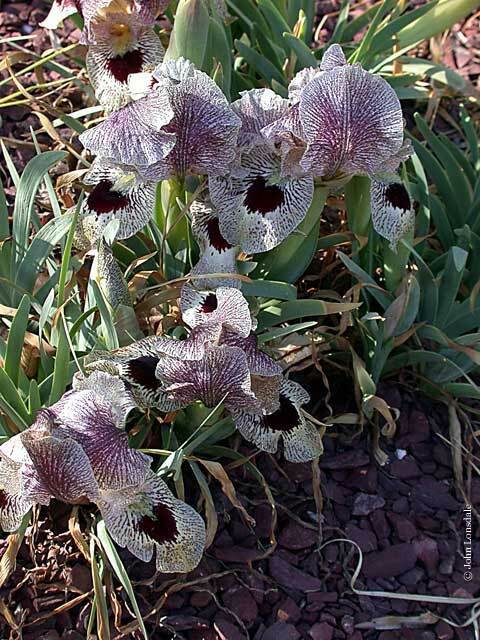 Pseudoregelia aril irises have unbranched stems and dark mottled flowers in shades of blue purple. They have beards on the standards and the falls. 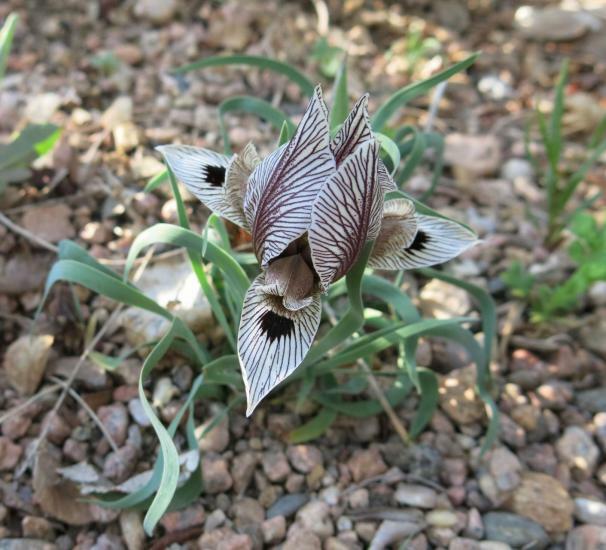 These usually dwarf irises grow on open rocky hillsides in Iran, Afghanistan and soviet central Asia where they have a long summer dormancy. 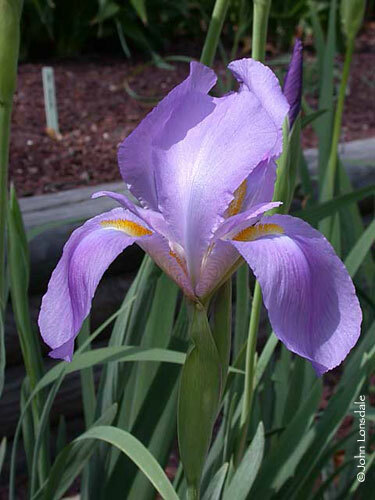 Regelia aril irises are from mountainous habitats and are unbranched with unmottled flowers and beards on falls and standards. 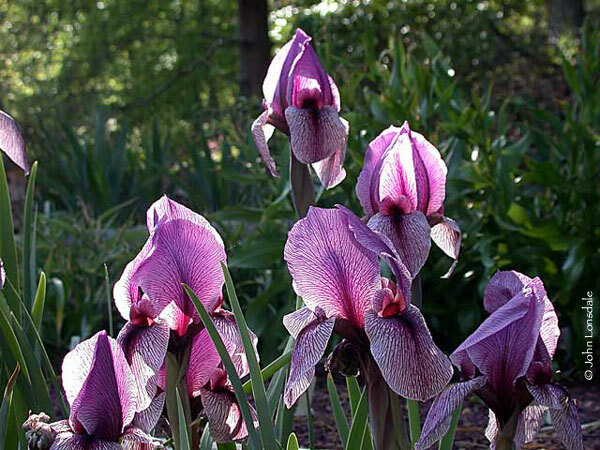 Iris acutiloba C.A.Mey. is a low-growing Oncocyclus found in the Caucasus, north of the river Kura. 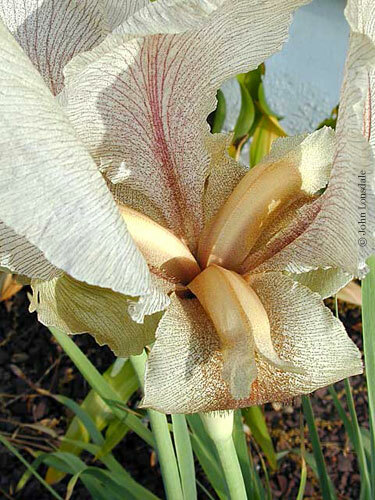 Fritz Kohlein, in his book Iris, says "the blossoms of this small plant render a somber, batlike effect." 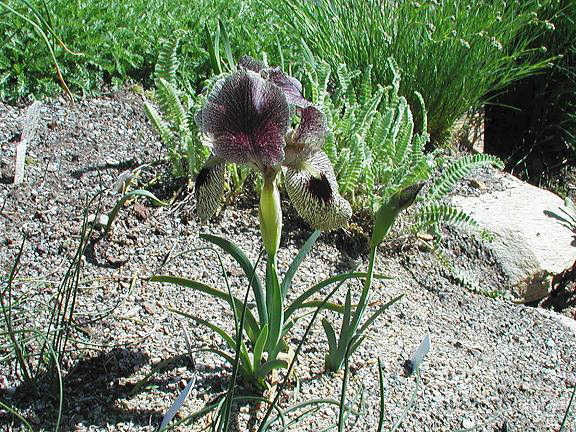 Iris acutiloba var. lineolata Trautv. 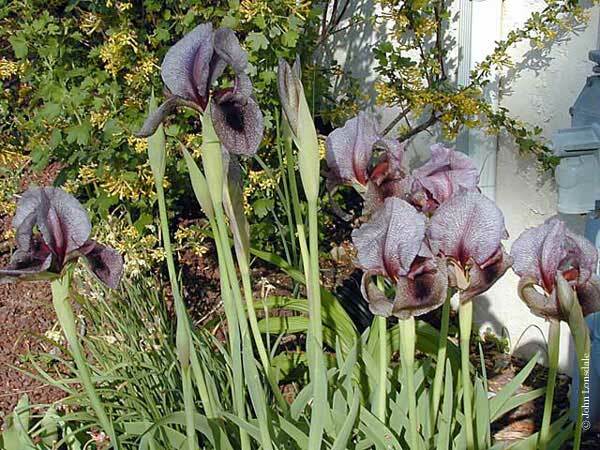 is considered by the Plant List to be a synonym of Iris acutiloba subsp. lineolata(Trautv.) B.Mathew & Wendelbo. If this one resembles a bat, it's a bat that bred with a zebra. Photo by Bob Nold. 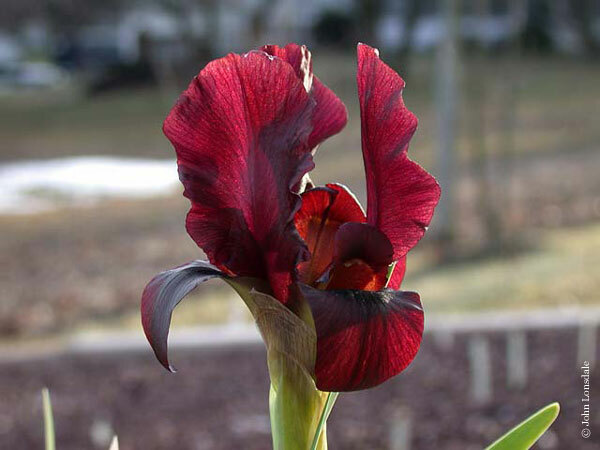 Iris atropurpurea Baker is in the Oncocyclus section and is from Israel. It has blackish-purple falls and a yellow beard. Photos by John Lonsdale. Iris 'Dardanus', one of the regeliocyclus hybrids (a name used for hybrids made between iris in the Regelia and Oncocyclus sections), photographed by Jim McKenney in his Montgomery County, Maryland, USA, zone 7 garden. This plant is now readily available, so there is no reason not to treat yourself to these lovely bits of eye candy. 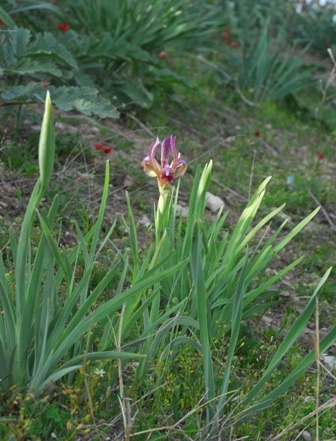 Iris gatesii Foster is one of the Oncocyclus section Iris from Southeastern turkey and northwestern Iraq. Photos by John Lonsdale. 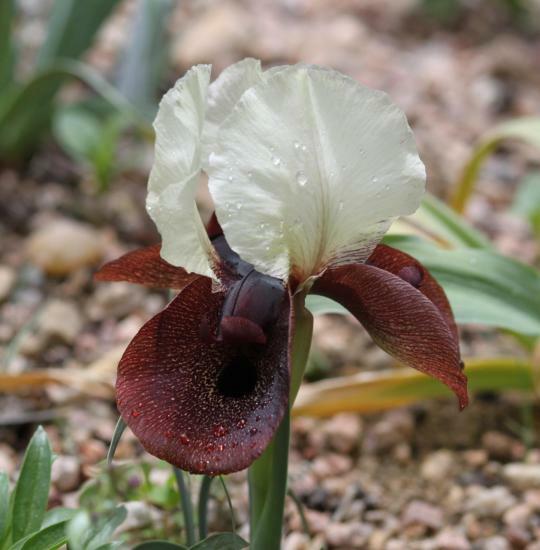 Iris hoogiana Dykes is in the Regelia section and is from Turkestan. It is blue with a yellow beard. Photos by John Lonsdale. Iris humilis Georgi is yellow, veined purple and in the Psammiris section. It is native to Eastern Europe and Russia. Photo by John Lonsdale. Iris iberica Steven is one of the Oncocyclus section Iris. This species originates from Iran, Armenia and Turkey. 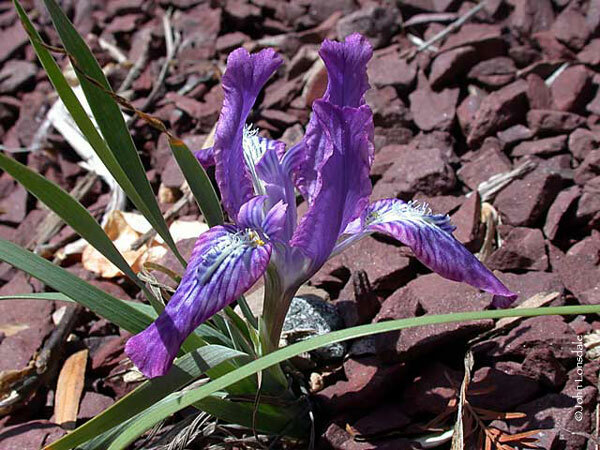 Iris iberica ssp. elegantissima (Sosn.) Fed. & Takht. has cream or pale yellow flowers with dark markings on the falls. First photo by John Lonsdale, second and third photos by Bob Nold. 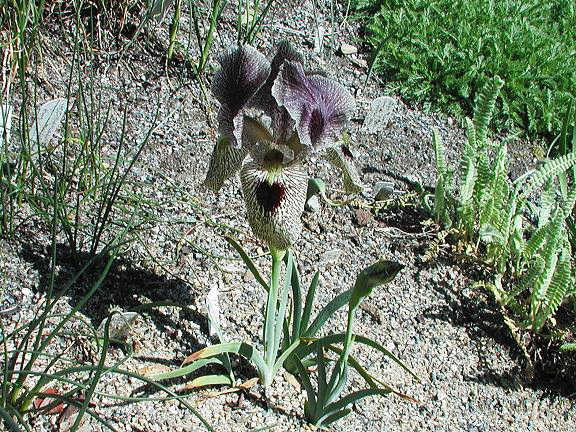 Iris iberica ssp. lycotis (Woronow) Takht. 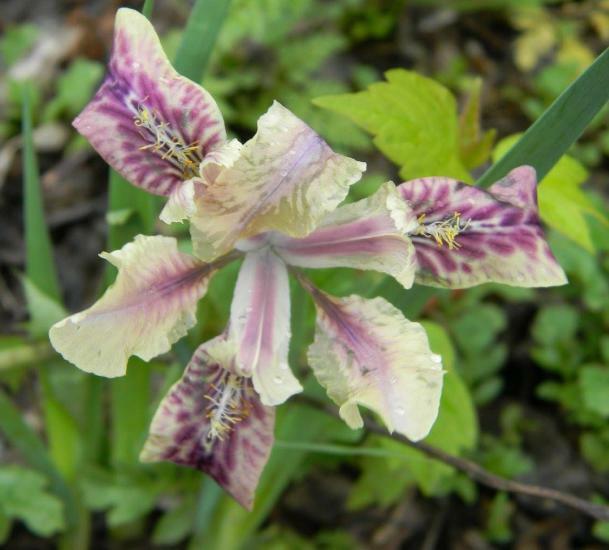 (also known as Iris lycotis) is from the Transcaucasus, where it grows at altitudes up to 6,500 feet (2,000 m). 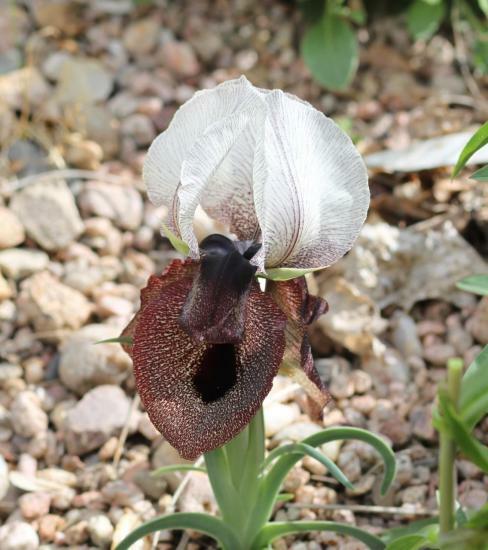 Fritz Kohlein reports that the large flowers are known locally as "Wolf's Ears," and come in eight color variations, including cherry red. Photo by Bob Nold. 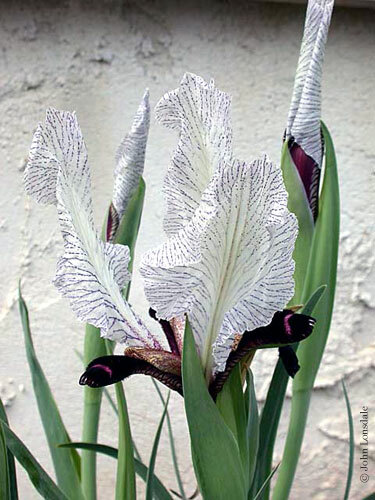 Iris kirkwoodiae Chaudhary was originally published as Iris kirkwoodii but named after Mrs Grace Kirkwood so the spelling of the name has been corrected. 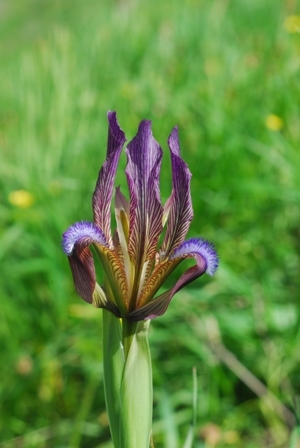 It is an iris in the Oncocyclus section from Northern Syria and Turkey. Photos by John Lonsdale. 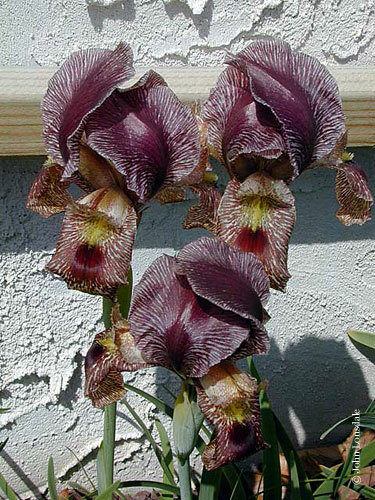 Iris korolkowii Regel is from Central Asia and the Regelia section. 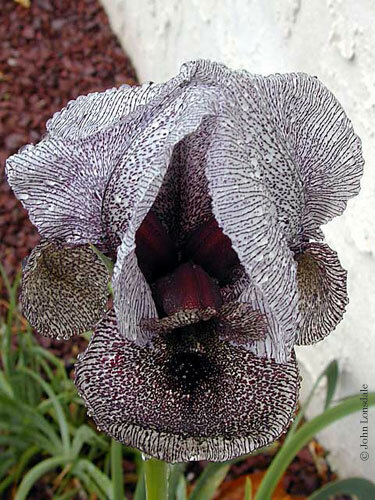 It is veined dark maroon on an ivory or lavender ground with a dark beard. Photos by John Lonsdale. Iris mandschurica Maxim. is in the Psammiris section. 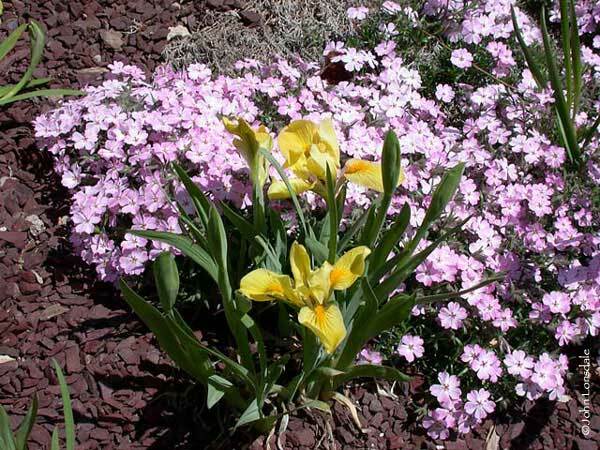 This species is from Eastern Russia, Manchuria, and Korea and has yellow flowers with maroon veined falls. Photo by John Lonsdale. Iris paradoxa Steven is a purple or violet flowered Iris in the Oncocyclus section from the Caucasus mountains in Armenia, Iran, and Turkey. It grows on stony hillsides at altitudes of 3,000 to 6,000 feet (1,200 to 2,000 meters). 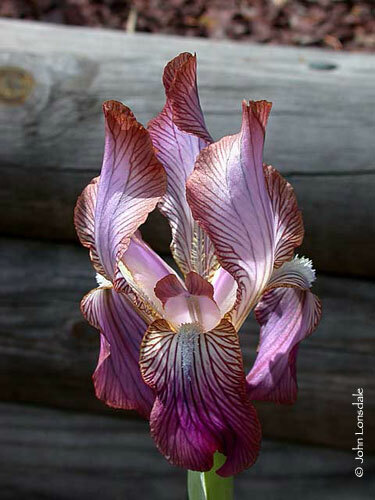 Iris paradoxa forma paradoxa photo by Bob Nold. 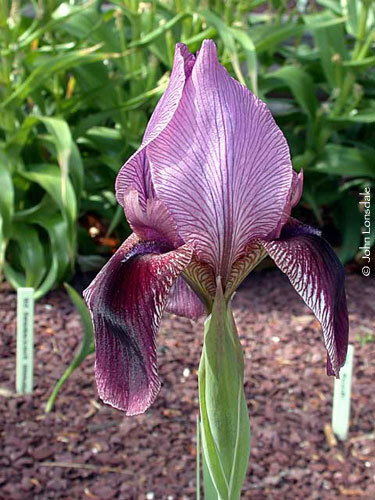 Iris paradoxa forma choschab (Hoog) B.Mathew & Wendelbo photo by John Lonsdale. 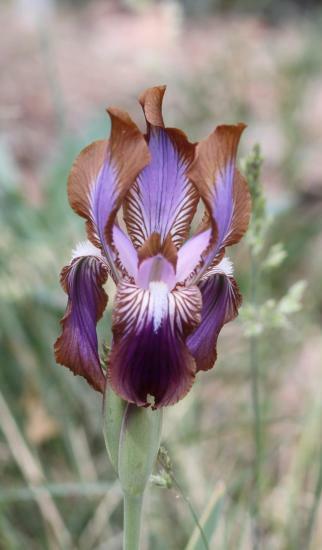 Iris sari Schott ex Baker is a fabulous miniature Oncocyclus Iris from central Asia. This species has very small, firm foliage and immense (by comparison) flowers of indescribable color and intricate markings, on a 3"-4" (7.5 - 10 cm) stem. 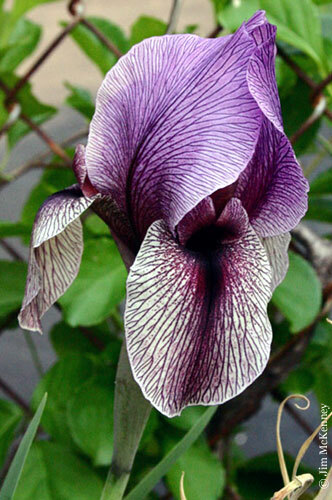 The scented flowers are tan and purplish, heavily patterned with dark purple. I have it growing in a raised sand bed... it's an AWESOME plant. Photos by Mark McDonough and John Lonsdale. 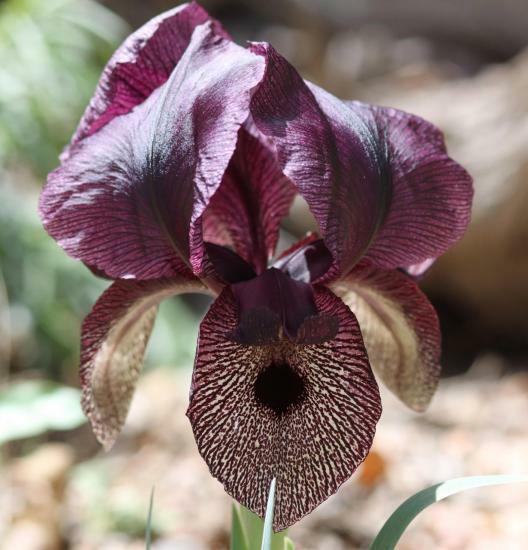 Iris sari dark form - The 2nd form of I. sari that I grow has much smaller, darker flowers. The flower is about half the size of the earlier form, more densely overlaid with dark purple netting, and the falls are lurid yellow overlaid with purple. In the photo, one can see the earlier flowering, semi-collapsed bloom of the much larger-flowered form of I. sari growing adjacent. The smaller dark form is on the right. Photo by Mark McDonough. 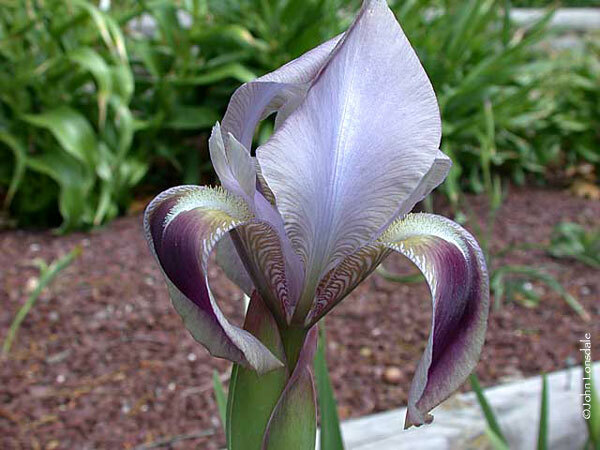 Iris stolonifera Maxim. is in the Regelia section and from Central Asia. It is light to deep brown purple with a yellow or blue beard. First photo by Bob Nold in his garden in Denver, Colorado. Remaining photos by John Lonsdale and Oron Peri taken in its habitat in Tajikistan. 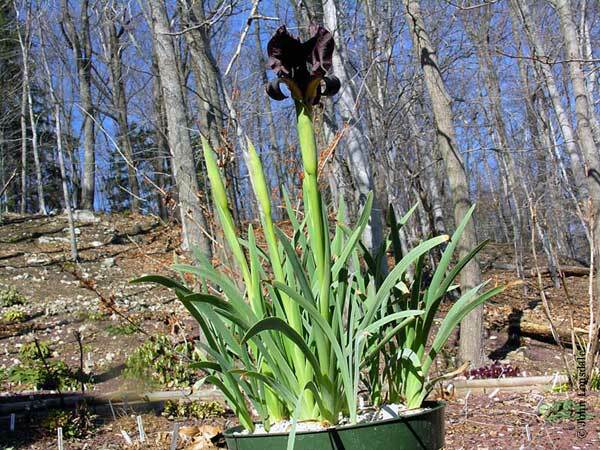 Iris tigridia Bunge ex Ledeb. from the Pseudoregelia section is native to Asia. Flowers are lavender to blue, mottled purple with a white beard. Photos by John Lonsdale and Andrey Dedov, respectively.